Flash floods near the Grand Canyon this week turned towering blue-green waterfalls into chocolate-colored mud, as hundreds of tourists planning to see a remote Indian reservation were forced to evacuate. Abbie Fink, a spokeswoman for the Havasupai Tribe, said 300 people had reservations for the village campground or the lodge located in Supai, Ariz., deep in a gorge off the Grand Canyon. "Every day it&apos;s closed, it&apos;s another set of people impacted by it," she said of the people who made reservations over the next few days. The tribe doesn&apos;t allow day hikers, so visitors have to reserve overnight trips, and the reservations fill up quickly. The tribal land outside Grand Canyon National Park is best known for its majestic Havasu Falls that appear like oases in the desert. Crews were assessing the damage Friday to determine when it&apos;s safe for visitors to return, but the area is shut down for at least a week. Two waves of heaving flooding Wednesday evening and Thursday morning forced 200 tourists to evacuate. They were stranded and have been flown out of the canyon, AZFamily.com reported. The popular campground was inundated with water rising high above the shallow creek that runs through it. Water sloshed up around tents, burying some in dirt. Tourists scrambled to benches, trees and caves as they sought higher ground. Some were stranded on newly formed islands, tourist Benji Xie said. "Everything is brown and muddy now," Xie, a 25-year-old Seattle resident, said Thursday while awaiting his turn to be flown out. All the tourists were accounted for and no one was seriously injured, Fink said. 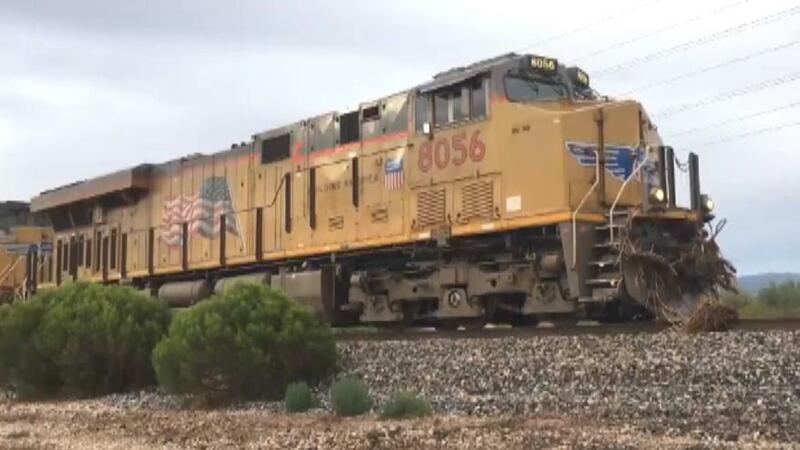 Investigators are working to determine the cause of a train derailment near Tucson, Arizona during heavy rain and flooding. Juan Garcia, who planned the trip since February, said he and his five friends started planning other activities when they heard the bad news, the Arizona Republic reported. Pamela Hokanson Gering said in a post in a popular Facebook group for Havasupai visitors that she is headed to Lake Powell, according to the Republic. Nedra Darling. U.S. Bureau of Indian Affairs spokeswoman, said the agency hasn&apos;t received a damage estimate but assisted in evacuating the tourists. The canyon is accessible only by foot, helicopter or mule ride. About 400 tribal members live there year-round. Amy Lieu is a news editor and reporter for Fox News.